Make a difference in N.C. in the new year! Duke Energy is seeking a damaging rate hike of nearly 17% that would hit low-income folks the hardest and lower incentives for solar and energy efficiency — all while forcing ratepayers to cover the cost of Duke’s coal ash mistakes. Show up and speak out! Community and environmental groups in North Carolina, Virginia and Tennessee continue to push for clean up of the coal ash in their areas and for access to clean water provided. In both North Carolina and Virginia coal ash impoundments are being drained into lakes and rivers, a stage in the clean-up efforts that is causing citizen and environmental groups concerns. Appalachian Voices is proud to support the Alliance for Carolinians Together (A.C.T.) 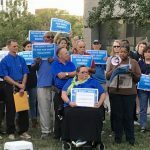 Against Coal Ash, a new grassroots organization representing North Carolinians impacted by coal ash.